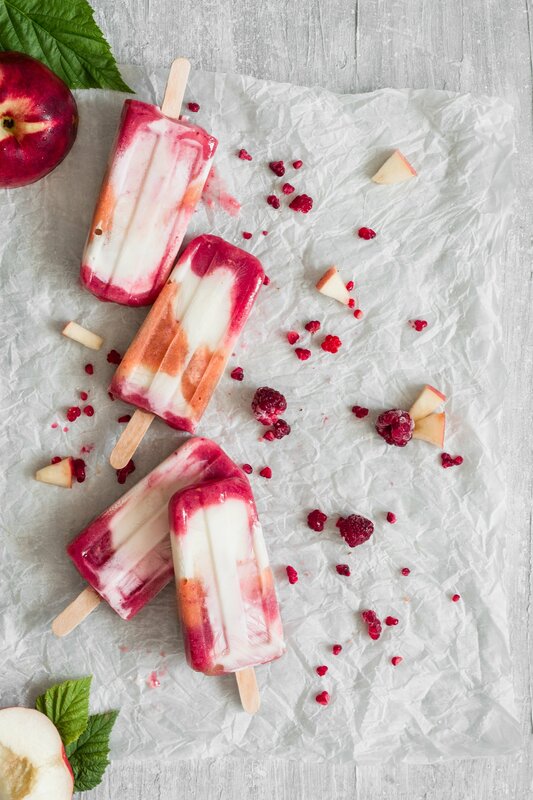 In this post you’ll find the recipe for these amazingly delicious peach raspberries popsicles! I’m back from my trip, I’m pretty nostalgic right now, more than the past few years. Maybe because it had been 10 months since we went visiting my boyfriend’s family? Maybe because it was even more intense than the last time we went there? The only thing I know is that Sicily is there…waiting for us. Always. I remember that a couple of years ago, during Summer when I was working near my hometown for 8 hours a day, the only thing I craved when I came home, was a huge slice of watermelon or a popsicle/icecream. Unluckily the ones you buy at the store are packed with sugars and unhealthy fats. So I used to puree some fruit and put that in the molds. Few hours of freezer and my popsicles were ready to eat. But these ones…oh man, these ones are beyond perfect! These ones have an extra touch: Greek Yogurt. 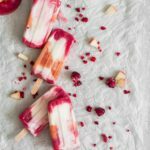 I just added a touch of agave syrup to adjust yogurt acidity et voilà: peach raspberries popsicles with amazing nutritional facts! What are you waiting for? Go and make them! P.S. Just to let you know: my nephews literally scoffed these homemade popsicles and they wanted to steal each other one. Delicious and refreshing peach raspberries popsicles with greek yogurt to enjoy during the hottest days! You'll only need 4 ingredients! Puree your peach/es and defrost your raspberries. Divide peaches’ pulp in two bowls and add the raspberries to one bowl. Combine one tablespoon of agave syrup with Greek yogurt. Pour a tablespoon of peach purée, raspberries purée and yogurt in each mould. Freeze and enjoy whenever you want! Ooooohhhhhhh these are so pretty and sound delicious! My kids go crazy for anything popsicle!